Football - FC Halifax Town v Braintree. Nathan Clarke for Halifax. Good news Town fans - defender Nathan Clarke says he would love to stay at the club next season. 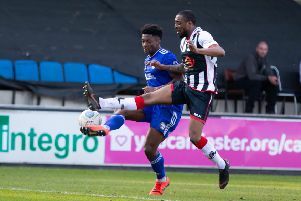 Clarke has been a key figure for The Shaymen at the heart of their defence, belying his 35 years with a consistently high level or performance. What the centre-back - who has played for Huddersfield, Bradford and Coventry among others - may lack in pace, he has made up for with awareness, bravery and leadership. “That was my 50th game this season, so hopefully I’ve surprised a few people,” he said of his previous appearance in last Saturday’s 2-2 draw at former club Leyton Orient, “but I feel fit and strong and really proud that I’ve managed to put on a good season. “I’ve not missed many training sessions, if any, so hopefully that’s a positive for the manager to look at. “I’ve already spoken to the manager about my desire to stay. “Since the manager’s come in he’s trying to build and do things the right way, and it’d be nice to part of that. “I played every game last season for Grimsby. Obviously there’s luck to it, not picking up any injuries, but I try to look after myself as best I can, I rest right, I don’t go out drinking. Clarke has formed an impressive partnership with Halifax skipper Matty Brown in central-defence, and is full of praise for him. “It’s been fantastic, I’ve loved playing alongside Browny,” he said. “His leadership skills are fantastic. I’ve told him on many occasions he can push on and keep going. “He’s a solid player, he’s quicker than probably a lot of people give him credit for, and his defensive skills are fantastic. 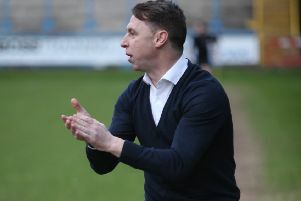 Clarke doesn’t feel there is much danger of the Town squad easing up with the end of the season looming. “Players are playing for their futures, so players that are here want to kick on and leave a good impression for the manager,” he said. “Everybody’s working, not just the starting 11 but the lads on the bench and not in the squad, are really pushing the manager to try and get that starting place, and that’s how it’s got to be.